I would like to know how your Totally Authentic Facts arrived at the conclusion that there are 50% more nefarious reasons to open an iPhone than legitimate ones. I listed several legitimate reasons yesterday like replacing the battery, screen, or case. I can't think of (or google) a single "nefarious" reason to open it. There's not a modder community out there looking to cheat at online games (like with X-Box). You don't need to open the case to jailbreak or unlock it, and I would say neither of those is "nefarious" anyway. Also, most hard drives just use standard Torx screws. They are often pretty small, but even if uncommon in cheap consumer kits, they use a standard and easily obtainable tool. Again, I'm not aware of a single nefarious purpose to opening a hard drive. I guess you could mess one up pretty bad opening it, but you can do that pretty well with the claw end of a hammer, too, or a puddle. "Can I creatively get one of the buttons to stop working or get the vibrate to go dead or something which will allow me to be able to take it in to apple store and get it replaced under warranty? It works quite ok but has been scratched up and dinged up quite a bit and I would love to get it swapped before the warranty expires." 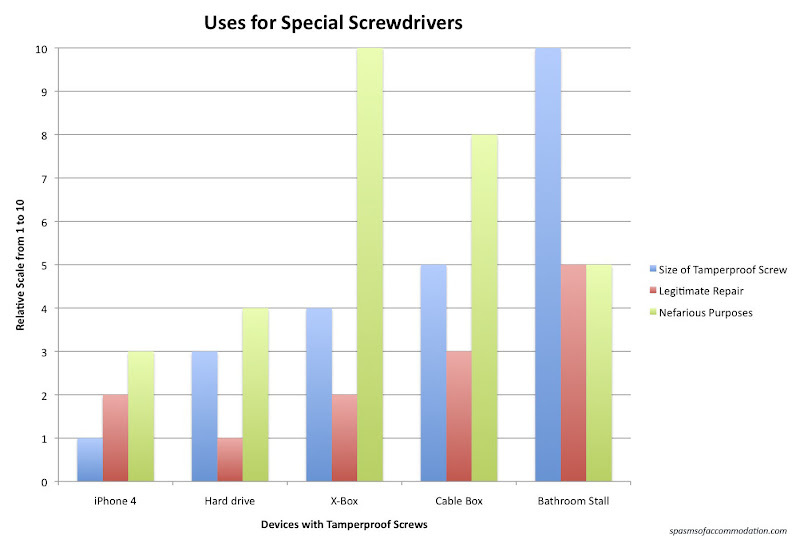 As for the hard drive, you're right, they have mostly plain torx screws. I included them to make the point that there is something even riskier to take apart than an iPhone. Somebody told me their roommate took apart a hard drive that stopped working thinking he could put the platters in a new hard drive and get his data back. I assumed it was a joke and that was the punchline. That's why I gave it the lowest rating of suitability for repair. I just took 6 hard drives apart a few weeks ago with the instructions to destroy the platters to be absolutely certain that nobody could recover any HIPAA protected data from them. I had to make 2 trips to Harbor Freight to get the screwdrivers to do this job. I think a hammer would be useless against a hard drive. The cases are cast aluminum and protect the platter amazingly well. And how would water hurt the platters? Even water out of a rusty iron pipe won't have enough magnetism to do any harm. Between that and the NSA standards of hard drive destruction I made up the nefarious number as being worse than the iPhone. If they're worried about the email though, then it might be comparable. Recovering the memory out of a disabled iPhone would get you the same thing. I don't know, maybe I just watch too many cop shows. Even the excellent tool manufacturer Wiha http://goo.gl/JiRO8 Doesn't make the five lobe driver for I-phone for example. Eh?